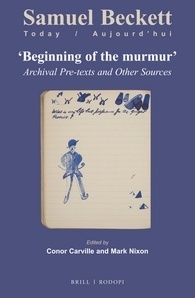 “Beginning of the murmur”: Archival Pre-texts and Other Sources, eds. Conor Carville and Mark Nixon. A new collection of essays edited by Conor Carville, University of Reading, and Mark Nixon, University of Reading. This issue of Samuel Beckett Today / Aujourd’hui collects a range of essays reflecting the diversity of Beckett Studies, many of which were presented at the conference in Reading to celebrate the 25th Anniversary of the Beckett International Foundation. Conor Carville is Associate Professor in English and Creative Writing at the University of Reading. His book “The Ends of Ireland: Criticism, History, Subjectivity” appeared in 2012. He is currently working on a book-length project on Beckett and the literary and visual image. Mark Nixon is Associate Professor in Modern Literature at the University of Reading, where he is also Director of the Beckett International Foundation. With Dirk Van Hulle, he is editor in chief of the Journal of Beckett Studies and Co-Director of the Beckett Digital Manuscript Project. He is also an editor of Samuel Beckett Today / Aujourd’hui and the current President of the Samuel Beckett Society. Contributors: Jonathan Bignell, Edward Bizub, María José Carrera, Conor Carville, Amanda Dennis, Peter Fifield, Lasse Gammelgaard, Scott Eric Hamilton, Tim Lawrence, Georgina Nugent-Folan, John Pilling, Siobhan Purcell, Rodney Sharkey, Paul Stewart, Rhys Tranter, Pim Verhulst.